NTT Inc. - Infrared Thermography Applications: How Can it be Used in Industrial Settings? Infrared thermography is the process of detecting infrared energy emitted by an object, using equipment like infrared cameras. Infrared thermography captures the temperature and displays the result in form of an image. With this technology, you can be able to capture thermal images of the area being investigated even without having to come into direct contact with it. With infrared thermography, it is possible to detect a significant rise in operating temperature long before deterioration of the equipment affected and as a result, prevent the failure of an equipment. Most failure in equipment whether, electronic, mechanical or electrical are indicated by a change in the operating temperature long before the failure occurs. Infrared thermography detects these temperature anomalies and therefore aid in correcting the problem before it deteriorates. Originally, the technology was developed for the military during the Korean War, however, its application has crossed over to other fields. Today, infrared thermography is used in various sectors, from medical to even electrical or mechanical engineering. Firefighters use the technology to see through the smoke and localize fire hotspots. Law enforcement uses the same technology in their surveillance to locate and apprehend suspects. 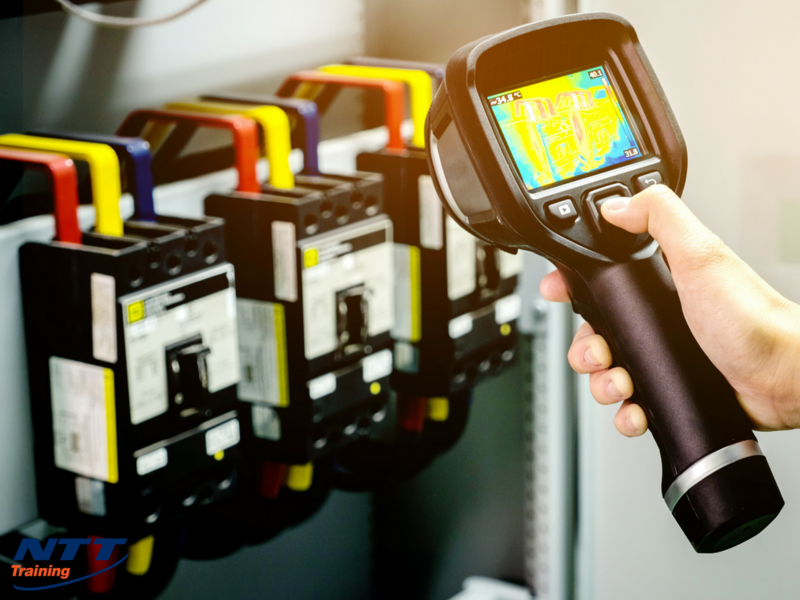 In any industrial setting infrared thermography is a maintenance procedure recommended as other than prevention of a complete failure in any equipment, it extracts solid results within a quick turnaround time and does not interrupt the normal workflow of the equipment being investigated. Below are some of the areas where infrared thermography is applied in an industrial setting. 30% of all fires in an industrial setting originate from an electrical malfunction. Whether on a large establishment or a small business, power lines are an important aspect. They are the source of energy to see through the running of equipment. If there are problems with the power line, most activities stand still and can cause losses in the establishment. It is, therefore, necessary to maintain the power line to prevent any of the above from happening. Infrared thermography done on the power line locates potential electrical problems which may cause failure in power transmission and distribution in the establishment. Aerial thermography technic is used on power lines to ensure the most accurate results. With this results, it is possible to identify the problem and correct it before a complete shutdown of the power line happens. Whether it is a small business or a huge establishment, a malfunction in the power line could cause productivity loss which in most cases results in long-term customer loss. A number of industries use rotary Kilns in manufacturing their products. Examples of these include; manufacturers of cement, aluminum, lime, and iron. It is important for these industries to monitor the evolution of hotspots in their equipment. Early detection of a hot spot is essential in preventing interruption in the production process. Infrared thermography comes in handy as it is the only appropriate technique that detects any anomalies in the system in real time. Most industries that require to combust their raw material in order to produce their products have a constant need to find a reliable technique to read temperatures in the combustion chambers. This is especially important with the increased standard fuel restrictions. There is a constant need for alternative fuels and hence the importance in monitor the flame pattern, size, and temperature. Monitoring all this is easy with infrared thermography even in unconducive environments. Other than a rise in temperature, infrared thermography also detects a decrease in temperatures. This, therefore, makes infrared thermography an invaluable source of information on the condition of any pipes in a building. Heat loss due to faulty insulation shows clearly in any infrared thermography report hence allowing quick repairs on damaged pipes, tubes, and even valve insulations. Infrared thermography detects problems like pipe blockage, leakages in pumps and insulation breakdowns which saves any establishment a lot of costs when detected early enough. Knowledge of infrared thermography is crucial for any industrial setting as explained above. An establishment will not only save on the cost of repairs on deteriorated equipment but will also benefit from its reliability in preventing adverse effects like fires and reduction in productivity. Knowing the condition of your equipment at all times is necessary since it allows you to make an accurate and informed decision. For this reason, it is important to train your employees on the subject. With employees who have gone through a safety training on the subject, you do not have to contract anyone to perform the infrared thermography. Employees in your task force with the skills will save you the expense as they can perform the diagnostics anytime. Enroll your employees to our NTT infrared thermography seminar where they will acquire this invaluable skill. Connect with us today for more information about how to train your staff.